Welcome to the Metroid: Samus Returns Missile Tanks locations guide that helps you find the total of the Missile Tanks locations in the 3DS action-adventure game. There are 261 Missiles / 35 Super Missiles. The overview for all these in-game Missile Tanks locations is listed below. Extra Missile Reserve Tank Tip: If you own a New Nintendo 3DS, New Nintendo 3DS XL or New Nintendo 2DS XL, you can use amiibo on the NFC area on the bottom screen. You can also use amiibo on Nintendo 3DS, Nintendo 3DS XL and Nintendo 2DS via the NFC Reader/Writer accessory (sold separately). You can tap the Super Smash Bros. series Samus amiibo to unlock a Missile Reserve Tank, which replenishes your missile supply should you run out. You can also use this amiibo to unlock exclusive Concept Art from Metroid: Samus Returns in the Gallery upon completing the game. Each Missile Tank you acquire increases your Missile capacity by 3. 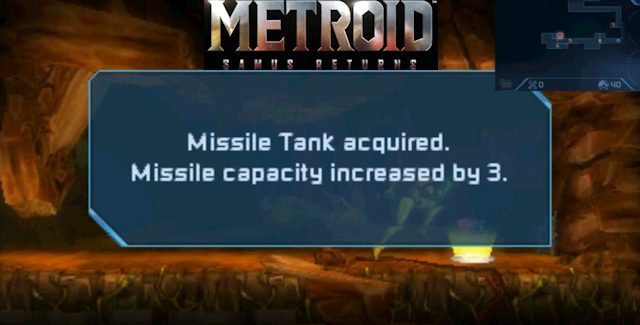 Where to find all Missile Tanks in Metroid: Samus Returns? The in-game collectibles locations for the Missile Tanks are described in this detailed video guide. The Missile Tanks are listed in the step-by-step video, in the order that they appear in each area chronologically. I hope these tips helped you get all of the Missile Tanks hidden in the game. Please comment if you have any additional Metroid: Samus Returns Missile Tanks location tips of your own, we’ll give you credit for it. – Thanks for visiting!